In testifying before the House Committee on Government Oversight & Reform today, former Federal Reserve Chairman Alan Greenspan conceded he “made a mistake” by emphatically believing that “free markets” could regulate themselves. In prepared remarks Greenspan writes, “I want to discuss how my thinking has evolved and what I have learned in the past year.” Lessons learned relate to Saturn, the planetary energy relating to karma, a Sanskrit word meaning action (the law of cause and effect). Saturn rules governments and authority figures. With his Saturn in Scorpio, Greenspan’s karma relates to his oversight of the debt and lending markets which are controlled by interest rates. 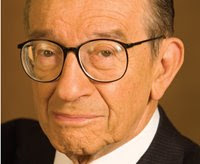 Greenspan’s Mercury harmonizes with Saturn; he thought financial markets would police themselves. With his Saturn harmonizing with Uranus in Pisces, Greenspan believed that regulation would stifle market innovation. If you asked most people what one word sums up Alan Greenspan it would be bubbles. Bubbles, whether in the bathtub (where he claims he does his best thinking), or in financial markets, are ruled by Neptune. Neptune rules credit, a word that means “to believe.” Born with his Sun and Uranus in Neptune-ruled Pisces, Greenspan will always be identified as “Bubble Man,” who thought he could financially engineer the economy from the dot com bubble to the real estate bubble. Greenspan is also called “Easy Al” for keeping interest rates too low for too long in his Saturn in Scorpio obsession with deflation. Even when mortgage rates were at historically low levels, Greenspan said people were crazy not to get an adjustable rate mortgage. Greenspan incessantly harped about “wealth extraction” (the home as ATM machine). The headwinds began to blow in June 2007 when Saturn in Leo opposed Neptune in Aquarius, as credit tightened and real estate values declined. Greenspan has always said it’s not the Federal Reserve’s job to pop bubbles; the Fed can clean up afterwards. Saturn began its clean up transit in Virgo last September. Greenspan admits the clean up required in this financial crisis is “much broader than anything I could have imagined.” Greenspan admits he is “in a state of shocked disbelief” over how fast and severe the credit markets have collapsed. This is because Saturn (financial structures) in Virgo (computer models) is beginning a series of oppositions to Uranus (sudden shocks) in Pisces (dissolving credit) through mid-2010. The “credit tsunami” began on September 15 when the Full Moon conjoined Uranus, a giant tsunami that took Lehman Brothers under, creating shockwaves felt worldwide. Times have changed and Greenspan is no longer viewed as the “Maestro,” deftly orchestrating the economy. Gone was the deference bestowed upon him by members of Congress. Mars in Scorpio was exactly challenging Greenspan’s Jupiter in Aquarius today, reflecting that his philosophical beliefs (Jupiter) were under attack (Mars). The chorus of critics has grown as Saturn in Virgo and Uranus in Pisces have been transiting over his natal Sun and progressed* Mars in Pisces. In 2009-10 Greenspan will experience a Uranus return**, when the planet representing freedom and individuality returns to where it was in the sky when he was born. As I wrote in the “Maestro” post, it’s time for him to relax and release his rigidly held beliefs to complete his final exam here in the Earth school. Greenspan’s natal Saturn in Scorpio challenges his Neptune in Leo. Unfortunately he did nothing during the positions he held in life to benefit the economic wellbeing of the nation. But no matter how old you are, it is never too late to change. *A predictive method that mathematically calculates the planets forward in time. **A Uranus return occurs around age 84. Greenspan was born March 6, 1926 time unknown, New York, New York.